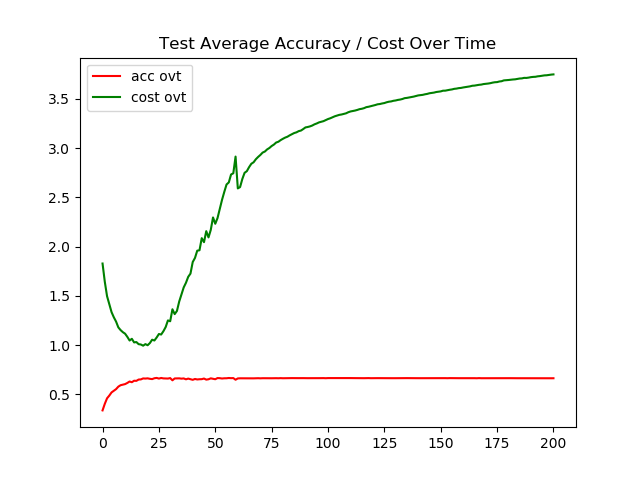 And I covered all of the optimization algorithms on this post that I learned from his blog post. Now this post is the second version covering more advanced optimization techniques. 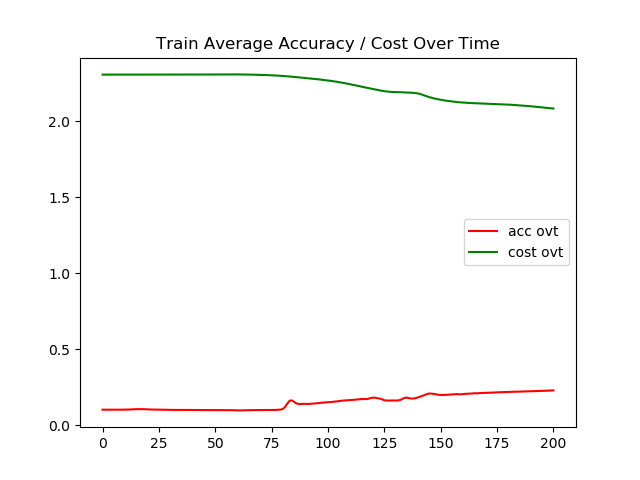 I recently covered ‘Fast and Accurate Deep Network Learning by Exponential Linear Units (ELUs)’, click here to read the blog post, and unfortunately the model that we implemented there suffered from over-fitting to the training images. So lets take a look at how each of these methods is able to increase the performance of the model. (Other words how well it can generalize) The reason why I say this is because all of these methods are tackling the problem of generalization. Please note that, for fair comparison (And I wanted to know how these methods improve the network as it is) so I did not add any additional layers such as batch normalization or any data preprocessing. Also all of the network were trained using some kind of variation of Adam Optimizer. 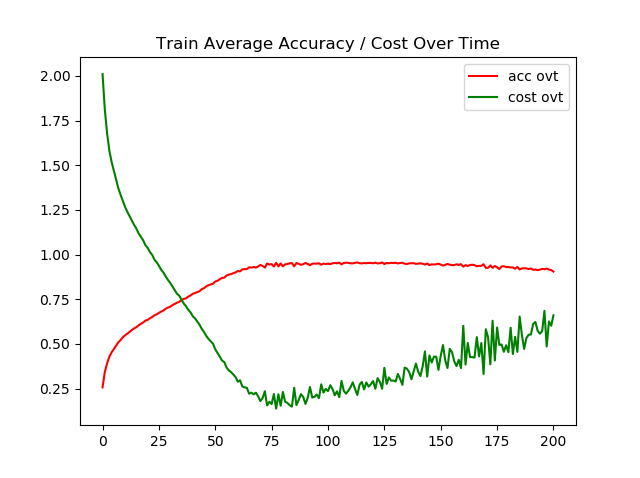 Above image is how the same network did when trained with auto differentiation (adam optimizer) with L2 regularization. 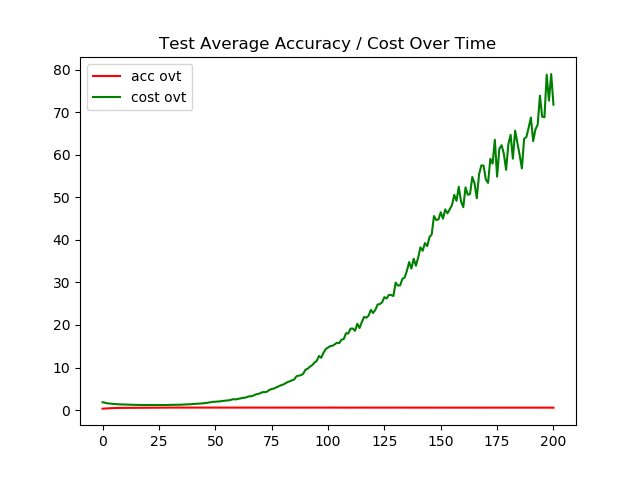 So in summary the benchmark we aim to beat with new optimization methods is 64 percent accuracy on testing images. Above paper is one of the main references Sebastian used in his blog post. So I thought it would be a good idea to link it here as well. 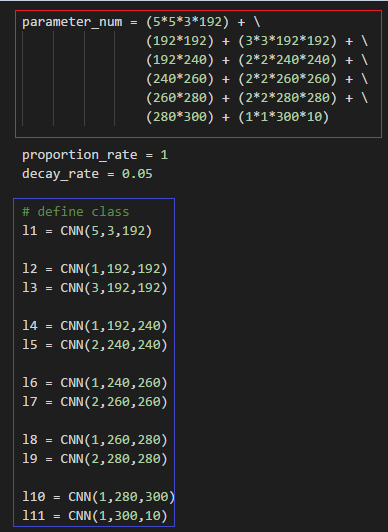 The first method is very simple when updating the new weights, we are going to add some kind of weight decay term (that is less then 1) multiply it with the weights as well as the learning rate. 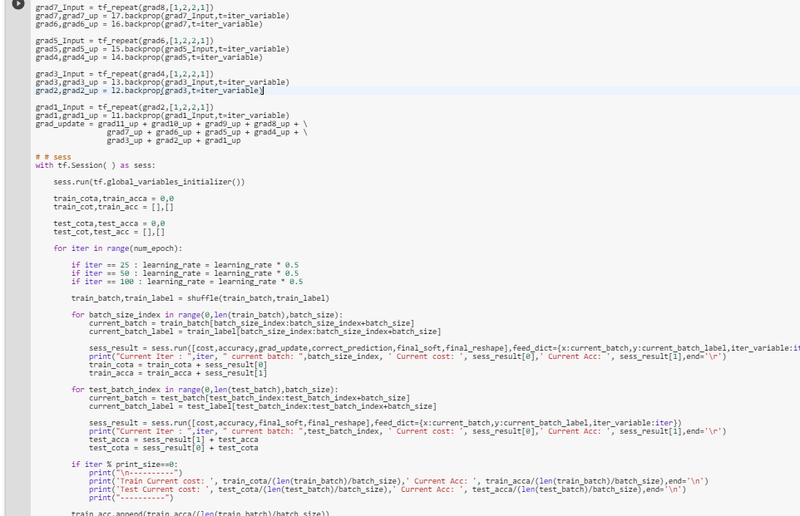 When implemented in python it looks like something below. 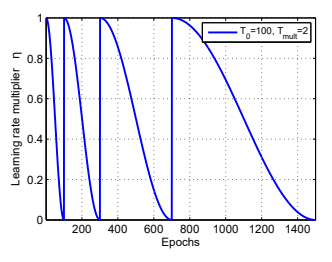 I have set the weight decay rate to be 0.512 and on each 10,50,100, and 150 iteration I halved the weight decay value. Due to cost rising up to 80 the graph on the right is skewed, however don’t worry I have attached the image below to show the final accuracy of the model. As seen above using this method we were able to achieve 56 percent accuracy on the test images. That’s not that great considering the fact that just adam with L2 regularization can achieve 64 percent accuracy. Finally when implemented in Tensorflow, it can look something like below. I personally like this method the most, since it is very simple to implement. But I understand when comparing tensors reduce sum might not be the best method, one other method can be comparing the Euclidean norm. 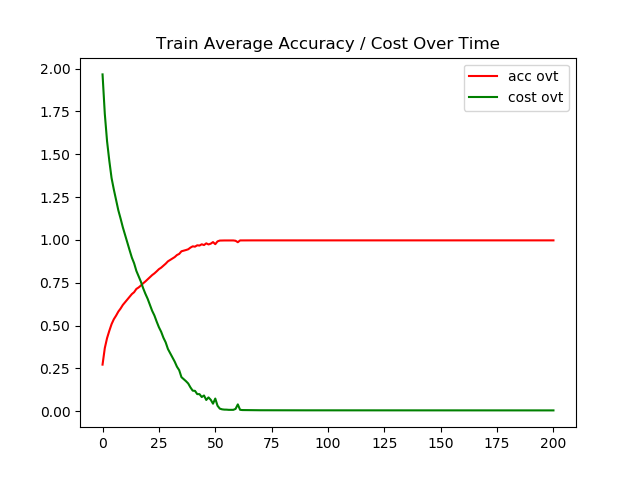 But now let’s see how the method have increased model’s performance. As seen above, this method did not fully prevent the model from over-fitting however it did get a better performance than our bench mark. 66 percent accuracy on test images, while 99 percent accuracy on training images, with no other forms of regularization methods except for the change we made in back propagation. For this we would calculate the number of parameters in out network. And if anyone wants to know how to do that, please click this link. Below is a simple example of calculated parameter values for VGG 16. Below is an example of calculating the parameters for our network. 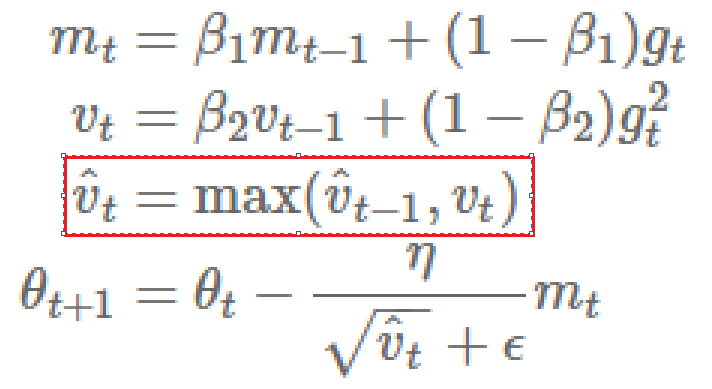 Now since we have the number of parameters ready, lets take a look at the equation to calculate the learning rate. With simple tf.cond() we are able to choose the minimum value between step_num^(-0.5) and step_num*warmup_steps^(-1.5). Finally lets take a look at the result. As seen above, using this method the model was not even able to perform well on the training images. I suspect that the learning rate could be higher for this method. Please note I interpreted step number as number of iteration (or current iteration) if this is wrong please comment below. 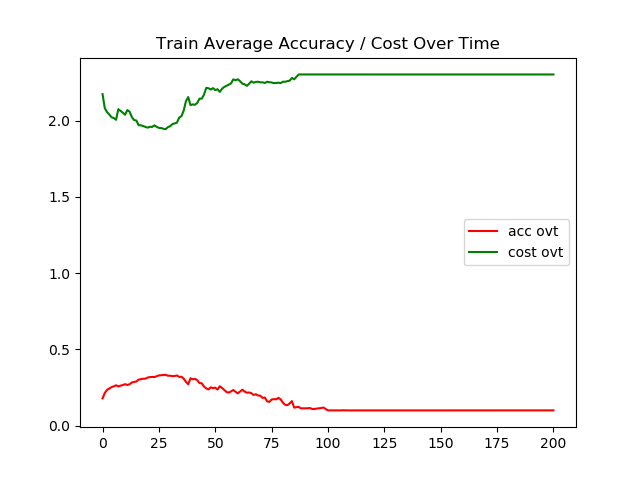 The finally accuracy for this model was around 23 percent for both training image as well as testing images. 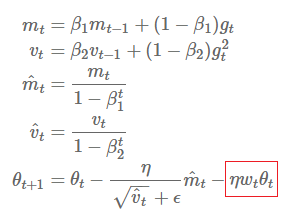 Above is the equation for stochastic gradient descent (SGD) with restarts. In summary the learning rate gets reset for every iteration Ti. So when we plot the learning rate over time it would look something like below. As seen above, the learning rate was set to 1 at iteration 1, again at 300, and 700 etc…. Now lets take a look at how to apply this method to Adam. As seen above, we first need to fix the weight decay, and we already saw this in action. (this is the method that we used in case 1) ). Now lets take a look at the implementation. There are different ways to implement restart, but I choose the simplest method LOL. Also please note that the authors of the original paper recommend to have the max value of learning rate set to 1, I have set to 0.001. 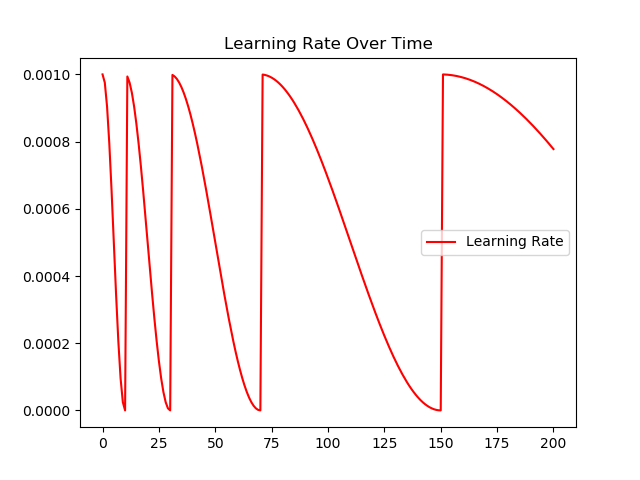 When we plot how the learning rate changes over time (for 200 iteration) it would look like something below. The restart iterations are set to 10, 30, 70, and 150. (When we set the first restart iteration to 10). Now lets take a look at the performance of the model. Well… no doubt the model did horribly. I actually spent many hours trying to get this model work but the model always seemed to learn something only at the beginning of the iteration and somewhere during training it seemed to overshot and stopped all learning process. As I REALLY want to know what I did wrong, please comment below if you have any recommendation for this model. Final accuracy for both training image as well as testing images were 9 percent…. To access the code for Case 1 please click here, to access the logs click here. To access the code for Case 2 please click here, to access the logs click here. To access the code for Case 3 please click here, to access the logs click here. To access the code for Case 4 please click here, to access the logs click here. These are amazing work done by multiples of smart researchers, however, FOR THIS EXPERIMENT none of it seemed to be the magic bullet where it can generalize extremely well. Loshchilov, I., & Hutter, F. (2017). 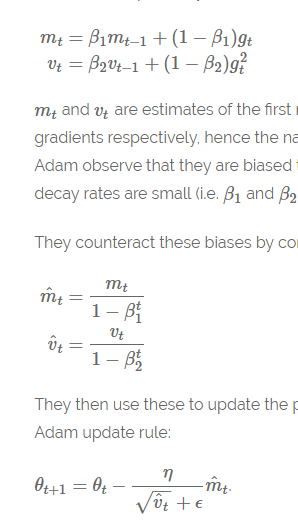 Fixing Weight Decay Regularization in Adam. arXiv preprint arXiv:1711.05101.